Gaetano Donizetti, L’ELISIR D’AMORE, Andrew Haji (Nemorino), Ying Fang (Adina), Brett Polegato (Belcore), Stephen Hegedus (Dulcamara), Elaina Moreau (Giannetta): Vancouver Opera Orchestra, Jonathan Darlington (conductor), Vancouver Opera Chorus (Chorus Master: Leslie Dala), Brenna Corner (director), Queen Elizabeth Theatre, January 21, 2018. Like its composer, Gaetano Donizetti, L’Elisir d’amore is thoroughly sweet natured. It was an immediate hit at its premiere in 1832 and has remained an audience favourite ever since. This is no surprise: its librettist, Felice Romani, was one of the best of his day, providing Donizetti with a delicious blend of buffo shenanigans and poignant romantic intrigue. The music itself is by turns sparkling and lyrical, containing one of the most beloved tenor arias in the bel canto repertoire. It features an amiable group of villagers, a love-struck young swain, Nemorino, a capricious young Adina (slowly becoming aware of her feelings), a delightfully pompous miles gloriosus in the person of Sergeant Belcore, and a splendid philosophus gloriosus in the mountebank, Dr. Dulcamara. All these elements work together beautifully, providing an entertainment of great fun and good heart, as well as sympathetic character interest in the two principals. Regarding the music, a composer can excel in one of two ways: they can work within tradition, making inventive use of its conventions, or they can break the mold and be a revolutionary. Though the latter is usually preferred by the critics, there is much to be said for composers who exploit convention imaginatively—like Bellini, Massenet and, here, Donizetti. Donizetti worked within tradition but he always made best use of the tools at his disposal—and no opera shows this better than L’Elisir d’amore. Besides the beautiful solo tunes, the ensembles are extraordinary in their rhythmic shifts and their admixture of recitative and cantabile dictated by dramatic need rather than by strict adherence to the earlier Rossinian tradition of recitative-cantabile-recitative-cabaletta/stretta. Especially fine are the ‘battling’ ensembles, where the voices are distinct not just in audible line but in conveying character—for example, the Act 2 Ai perigli della guerra, with Belcore’s parlando praise of the glories of the military life against Nemorino’s lyric assessment of the cost of joining up; also the last scene’s Quanto amore, with Dulcamara’s self-interested parlando against Adina’s lyric recognition of the depth of Nemorino’s love. There is also Donizetti’s wonderful use of the chorus, a set of characters in its own right. Everything is employed to further the drama, Elisir providing an object lesson in musical dramaturgy. This is an opera that appears easy because it moves so deftly, but the superb precision, variety, and rhythmic shifts make it very difficult to do well. All this is a prelude to saying that Vancouver Opera gave a dazzling production of L’Elisir d’amore on all counts. One of the things I particularly liked is that it did not attempt to be overly comic. It was funny, don’t get me wrong, but it did not go overboard on caricature. For this, we have to thank the excellent direction of Brenna Corner (following the inspiration of James Robinson), the fine natural acting of the cast and the overriding emphasis on emotion—especially as exhibited in Adina’s journey to recognition of her true feelings for Nemorino. Aiding the director greatly was Adina herself, beautifully played by soprano Ying Fang. Ms. Fang’s singing was not only immaculate, performed with clarity and style, but always invested with strong feeling. From the start you knew her confused heart was set on Nemorino. Her acknowledgement scene at the end—Prendi, prendi—was exquisitely sung, with strong involvement both in her voice and in her acting. Ms. Fang was excellent throughout as, for that matter, was the whole cast. 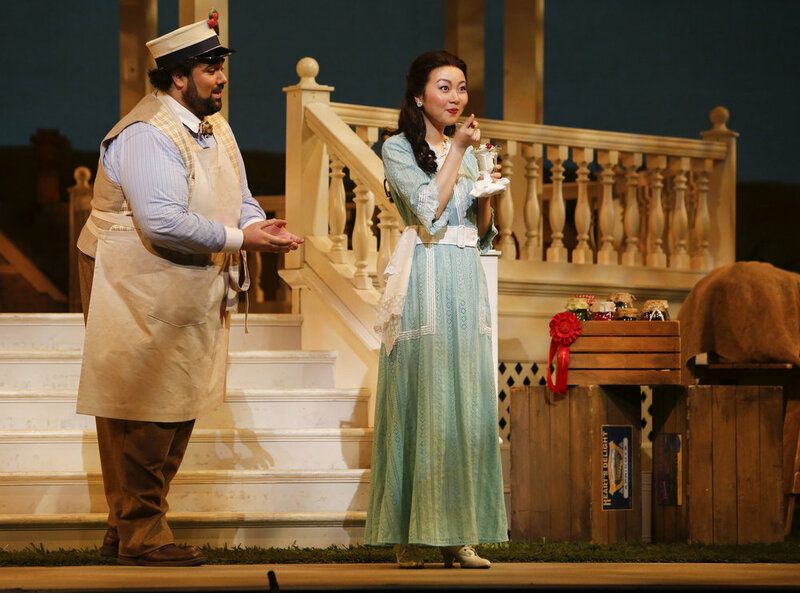 Andrew Haji gave a convincing performance as the love-struck Nemorino, and his signature tune—Una furtive lagrima—was a glorious accomplishment, elegantly sung, with a strong sense of incredulous happiness at being loved at last. Brett Polegato as Belcore played his role with swagger without going over the top—a very natural performance—producing wonderful sound with his suitably manly baritone. He sang his opening number—Come Paride vezzoso—with a fine languor of self-regard. He proved himself just as capable in those numbers that required parlando or quick time, both of which he effected with panache. Especially well done was the duet in the second act—Ai perigli della guerra—where he plays against Nemorino’s dolorous estimate of the cost of signing up. Stephen Hegedus gave us a characterful Dr. Dulcamara, played more on the sleazy than the commanding side, but what can you expect from a con man who arrives in town on an ancient motorcycle with a side car? I particularly enjoyed his performance in the Act 2 barcarolle, where his three-toothed senator proved a most slimy and sibilant roué. Finally, the Giannetta of Elaina Moreau was sweetly played and deftly sung. And the excellence goes beyond the cast: the convincing and moving direction of Brenna Corner conjoining with the splendid conducting of Jonathan Darlington, who drew impeccable and glowing sound from his band. Right from the overture, you knew you were in the hands of a maestro who had the measure of this delightful score, with the instrumental lines transparent, rhythms tight, dynamics kind to the voices, and the forces crisp in the devilishly demanding ensembles. His lyric passages sang and his ensembles sparkled. Leslie Dala’s chorus was outstanding—with beautiful and precise singing in a work where the chorus represents an ever-present set of individual characters. Choreography was fluid and pleasing, conveying a sense of encounter with real people. This paid great dividends in one of my favourite numbers—Saria possibile – where the chorus and Giannetta delightedly share the information that Nemorino has become considerably more attractive through his inheritance. The set of Allen Moyer was inventive and striking, its main focus a village bandstand center stage, with Nemorino’s ice-cream truck downstage right, complemented by Dulcamara’s motorcycle downstage left (both entering with the putt-putts of yesteryear). These three fixtures made for a gratifying fluidity of action as characters moved back and forth between them. This set, of course, displaces the story from mid-19th-century Tuscany to pre-WWI rural Canada. As does Adina’s transformation from a landowner to a small-town librarian, and Nemorino from a swain to a hawker of ice cream. While such updating seems all too mandatory these days, this one works. The bandstand was an inspired choice, being a center of village life in those days—like a piazza in an Italian village—a locus of public and celebratory occasion. And a sweet ice-cream truck only adds to the sense of a happy outdoor world. Also, such changes give a greater degree of familiarity to the story and probably provide a greater sense of nostalgia for a Vancouver audience than the original could have done. Nonetheless, homage was paid, on the stage curtain—a beautiful rendition of the Tuscan countryside—giving you a good feeling about the world you were about to enter. Thanks to Vancouver Opera for a superior and thoroughly engaging encounter with this loveliest of comic operas. We left the auditorium with the same warm glow that emanates from the work itself. Upcoming performances January 25 & 27 at 7:30pm, QE Theatre.